Runner Gareth Warburton of Caernarfon already has one Commonwealth Games under his belt and this time he's doubling his distance. He'll be stepping up from the 400m to the 800m, as well as being a member of the relay team. "I don't know what Delhi is going to be like, but Australia was amazing," said Gareth, 27, who started off as a promising rugby player before switching to athletics. "They put on a fantastic show and the facilities were great. Everything was on time, the stadiums were full and it was really interesting staying in the athletes' village." He's still sure putting on the Welsh vest will feel just as good in India. "Growing up in north Wales, Welsh pride is instilled in you. This is the only chance you get to compete for Wales and it's great because all my friends are in the team," he said. Gareth's proudest achievement so far is winning a silver medal in the 4x400m relay in the 2005 European Championships. 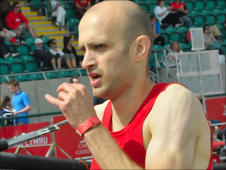 Despite specialising in the 800m, he'll be keeping his place in the Welsh relay team alongside European 400m hurdle gold and silver medal winners, Dai Greene and Rhys Williams. "None of us are strictly 400m specialists in the team, but we should stand a good chance," said Gareth. "I prefer the 800m now. You're not stuck in your lane all through the race - you converge into one lane and you've constantly got to think of what everyone else is doing. "If there are fast finishers, you don't want to end up at the front too soon, or get boxed in." 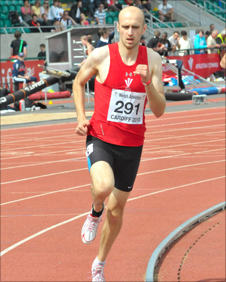 Gareth's dedication to athletics took off when he left Caernarfon for the University of Wales Institute Cardiff, a college well-known for sporting achievement. "The facilities in Caernarfon were pretty poor - everything's in the south," he admitted. "UWIC has one of only four or five indoor running tracks in the UK. I work part-time in UWIC's library and they're great at giving me time off to compete. "We don't get paid thousands like footballers and getting money can be tough."